Ramona Jiu Jitsu Kids Win 2013 World Titles! On July 20th the Ramona Brazilian Jiu Jitsu competition team sent several athletes to the Kid’s World BJJ Champions in San Bernardino. Over 600 Brazilian Jiu Jitsu practitioners from as far as Australia and Germany competed for world titles. The RBJJ team brought home 5 world champion titles and all competitors placed at least in the top 3 of their divisions. Bringing home the gold, and the title of “World Champion”, were Nathan Kiddoo, Berlin Kiddoo, Gabriel Kiddoo, Jay Friend Jr., and Hunter Mahaffey. Each of the competitors were top in their divisions and impressed coaches and the audience. Savannah Kiddoo, Hayley Friend, Matthew Duvalian, and Matthew Mendoza each took second place in tough divisions. Logan Mahaffey and Wyatt Jones fought hard and took third in their divisions. In all, out of 11 competitors, the RBJJ competition brought home 11 medals. Coach Kevin Hosseini is proud of all the competitors. Ramona Brazilian Jiu Jitsu/MMA is a locally owned family training center and provides the highest quality programs for both adults and children, which includes; Brazilian Jiu Jitsu, Submission Wrestling, Self-Defense, MMA (Mixed Martial Arts), Muay Thai Kickboxing, and Boxing. For more information about Ramona Brazilian Jiu Jitsu please call 760-787-5855 or visit www.ramonajiujitsu.com. The picture is courtesy of Elizabeth Mahaffey. In the back, from left to right is; Nathan Kiddoo, Jay Friend Jr., Hunter Mahaffey, Matthew Mendoza, and Matthew Duvalian. In the middle row is; Savannah Kiddo, Haley Friend, Logan Mahaffey, Gabriel Kiddoo, and Berlin Kiddoo. In the from is; Coach Kevin Hosseini. Even though he's the youngest Brazilian jiu jitsu black belt to start an academy in San Diego County, Kevin Hosseini believes he has a lot to offer. “I love teaching kids, I love teaching adults,” Hosseini said. “I’m kind of a big kid myself. 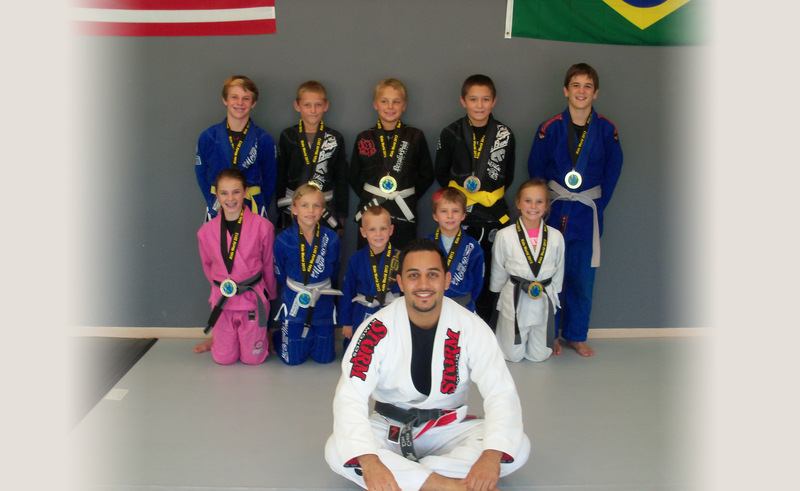 I make it a fun atmosphere here.” Hosseini runs the Ramona Brazilian Jiu Jitsu Academy with pupils ages four to 63. His students have rolled up medals galore in the Grappling X competition circuit, but that's not really why he teaches. The 26-year-old wants to eliminate bullying in schools. “The main thing is when a kid has confidence in themselves, to be able to stand up for themselves, just that energy that you put out is what's going to stop people from bullying you,” Hosseini said. Alexis Sherman, 8, takes classes a couple nights a week. She recently finished third in the west coast in the tournament of champions and she, too, believes jiu jitsu helps her avoid confrontations. “I like it because other people get to defend themselves,” she said. “And it's kind of fun to be with other people and make new friends.” “The biggest effect I've seen, at least in my kids and my family, is that they're becoming mature a little bit quicker,” said Sherman’s father Justin. “They are understanding respect, that there is a right time and a right place to do the things that they want to do. There is a lot of discipline that they learn in this.” Contrary to what it looks like, Hosseini said jiu jitsu is called “The Gentle Art” and he focuses on technique so no one gets hurt. “The first thing I tell people is I say, ‘You're not here to try to prove a point to somebody. You're not here to fight somebody. Not here to say you’re the big man on campus,’” Hosseini said. “We're here to help each other out to progress with each other.” Hosseini said jiu jitsu kept him from dropping out of high school (he graduated from Mira Mesa High School) and he recently earned a degree in civil engineering from San Diego State University. Instead of designing buildings, he's helping people build a foundation - from the mat up.